4x4s and crossovers part 2 | What Car? Saab is still recovering from its financial woes of 2010, so the firm will be praying that this new 9-4X crossover enjoys the same sort of success as the similarly sized Volvo XC60. The first production version, which was unveiled at the LA motor show in November, has a turbocharged 2.8-litre V6 petrol engine with 296bhp and four-wheel drive. Its safe to say that this version wont trouble the market leaders in Europe. 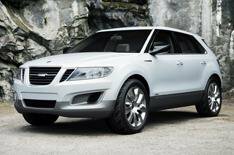 However, Saab has a good crop of strong and efficient diesel engines to call upon, and we expect that two-wheel-drive versions will be available, so the 9-4X could yet prove very tempting for SUV buyers in the UK. Saab has promised sporty driving characteristics to go with the striking looks, and to that end, some versions will have Saabs adaptive chassis control known as Drivesense. Saab is also promising a roomy cabin with flexible seating. Those familiar with the old Ssangyong Korando will know it as a rough-and-ready off-roader that felt distinctly agricultural. The next version, however, will be completely different. The new Korando is a crossover that is similar in size to cars such as the Kia Sportage and Hyundai ix35. Like those cars, itll also be available in both front- and four-wheel-drive formats. A 2.0-litre diesel is the only engine available at launch. Its 173bhp sounds appealing, but economy of 47.1mpg and CO2 of 157g/km is pretty average. Dacia is owned by Renault, and specialises in no-frills transport at a budget price. The Duster is already on sale in other European markets, but wont arrive in the UK until late 2012. Its a pity, really, because as a proposition its very much of the moment. Its a Nissan Qashqai-sized crossover that will start at a staggering 11,000, which would suit many families in these times of austerity. Weve driven it and its pretty good the ride is smooth and although the interior is basic and bland, you really wouldnt grumble for that sort of money. All the talk coming from the Range Rover camp about the new Evoque revolves around the fact that its the lightest, most fuel-efficient Range Rover ever. Seems like a strange way to introduce such a stunning-looking new car. Theres a good reason for it, though. The Evoque is seen by the company as a catalyst for change the first of a new generation of more sustainable, more socially relevant Range Rovers. Many would argue its a change that needs to be made. Lightweight construction is only part of the story though. The Evoque takes the bold step of being the first ever Range Rover to be offered with two-wheel drive as well as four-wheel drive, and all cars with manual gearboxes will have stop-start technology. Of course, the engines are also integral to the cars green credentials. The Evoque will use two variations of the 2.2-litre turbodiesel found in the Land Rover Freelander, giving either 149bhp or 188bhp. The cleaner of these, when combined with two-wheel drive, should sneak under 130g/km for CO2 emissions, and return an average of around 50mpg. For those Range Rover customers who still value performance over the planet, therell also be a 237bhp variation of Fords turbocharged 2.0-litre Ecoboost petrol engine with an automatic gearbox and four-wheel drive. The Evoque will be built on a heavily modified version of the Freelander platform, but itll occupy less road space thanks to shorter overhangs. Itll be available with either three or five doors from August. It's been the lengthiest will-they-or-wont-they saga since Kat and Alfie in Eastenders, but its still not known whether Porsches small SUV project will ever make it into production. The company confirmed plans to produce a small SUV some time ago, but the project has since been put on hold while Porsche conducts a review into its plans for future models. Were expecting a yes or a no by the end of 2010. So, what do we know about the project? Well, not that much. Its rumoured that the car will be called the Cajun, and that itll be based on the same mechanicals as the Audi Q5. We dont know whether thatll include the use of the Audis engines. However, wed find it surprising if a car like this werent offered in both petrol and diesel formats, and since Porsche already use VW Group diesel engines in other models, it would seem like a logical step. Toyota has made a fully electric version of the RAV4, partly thanks to the firms financial ties with electric car specialist Tesla. It hasnt yet been decided whether the production version will come to Europe, but its due to go on sale in the US in 2012. What's your most exciting car of 2011? Take part in our Car of the Year poll.